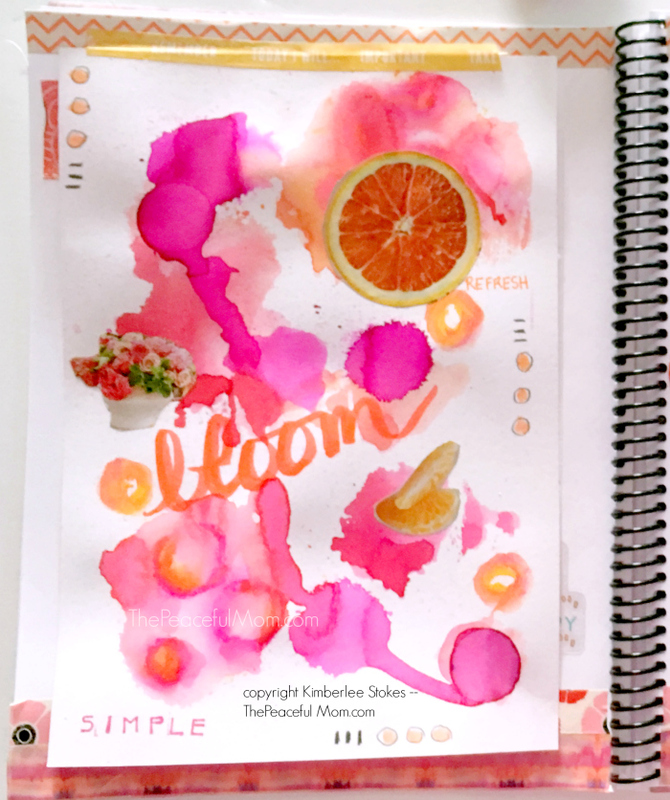 Take a peek at my monthly vision board and learn how to make your own! If you’re like me, your life is super busy and if you’re not careful, you can become caught up in just putting out the next “fire” rather than living your true priorities. One way I combat this problem is by stepping away for a short time each month to review my long term goals and create a monthly vision board. 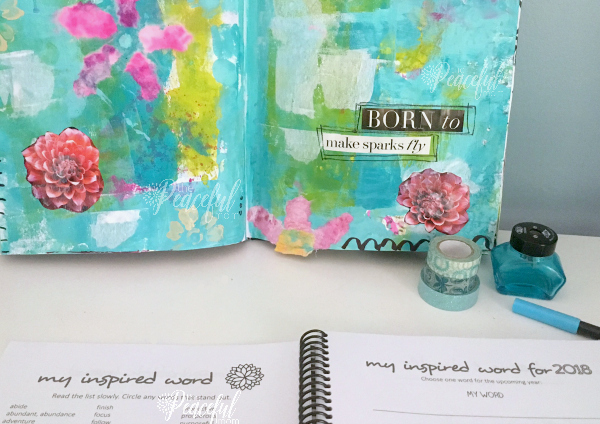 I love creating a monthly vision board because it enables me to break my big goals down into more do-able, short term steps so I can make progress on my goals without feeling overwhelmed. 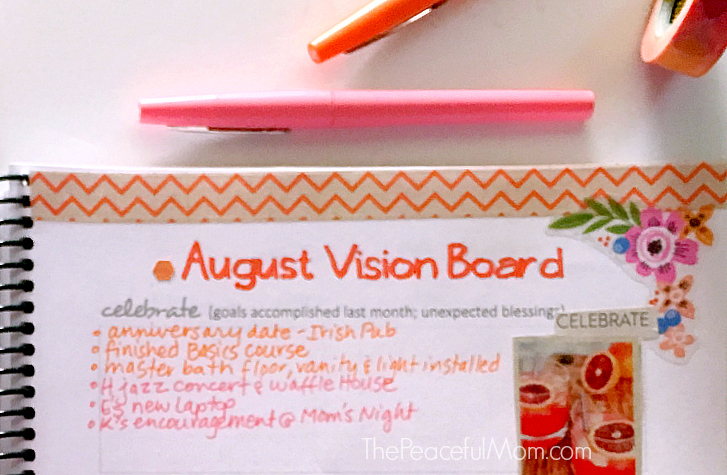 The first step in making an effective monthly vision board is to take a look back and celebrate all of the blessings, happy happenings and accomplishments of the previous month. For last month I’m thankful for a fun anniversary date with my hubby, finishing my Beautiful Basics Video Course, and FINALLY being able to install the new floor tile and vanity in our master bathroom (before and after photos coming soon!). Next it’s time to think about what you want to happen in the upcoming month. 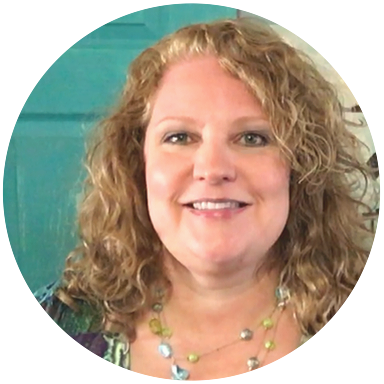 This powerful step enables you to narrow your focus and choose what’s really most important for the next few weeks. In addition to the arty vision board, I add words and phrases that express how I want to feel and what I want in the upcoming month. 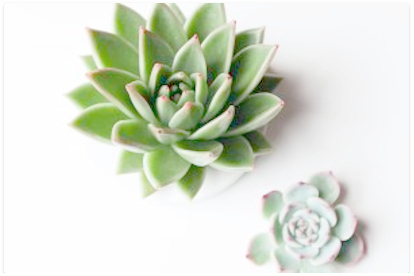 For August, I’m focusing on simplifying, being more creative and productive. 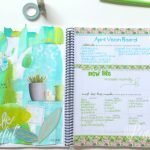 The final section of a good monthly vision board is the list of actionable steps you need to take for the upcoming month. I divide this section into six segments: personal, people, passion, purpose, projects and events. I try to limit my action steps to just a couple in each category to ensure that I can actually accomplish them. 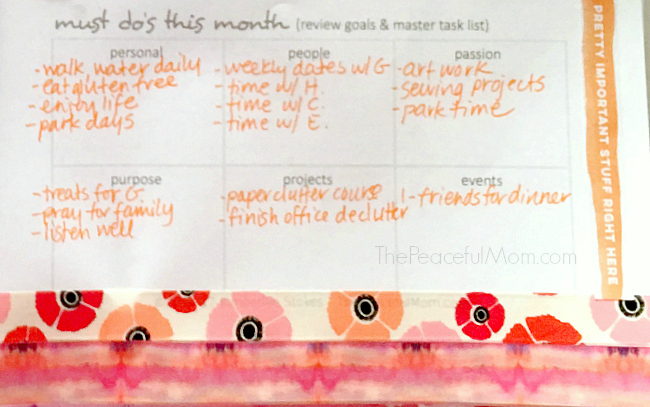 This month I’m focusing on my usual self-care steps (daily exercise, drinking lots of water, eating gluten free); spending individual time with each of my family members; producing more artwork and working on a new paper clutter video course. 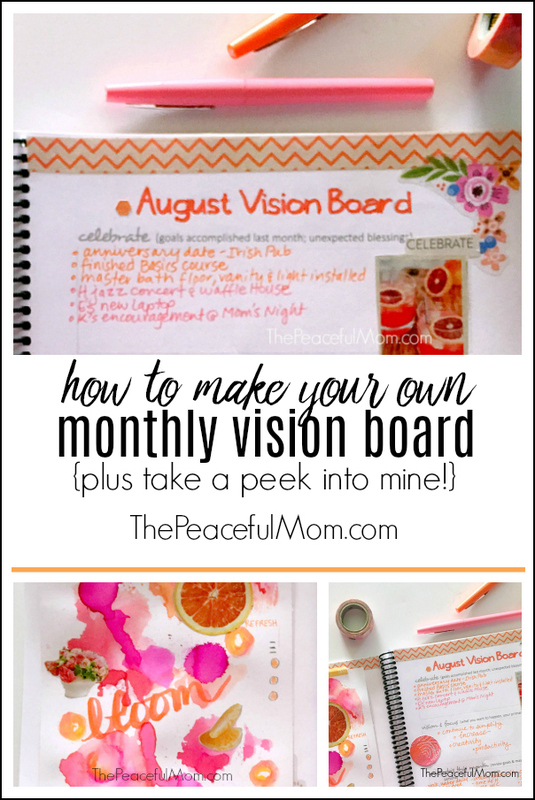 If you haven’t tried creating a monthly vision board, I encourage you to start this month. You’ll be amazed at how it helps you to focus on what truly matters most to you. 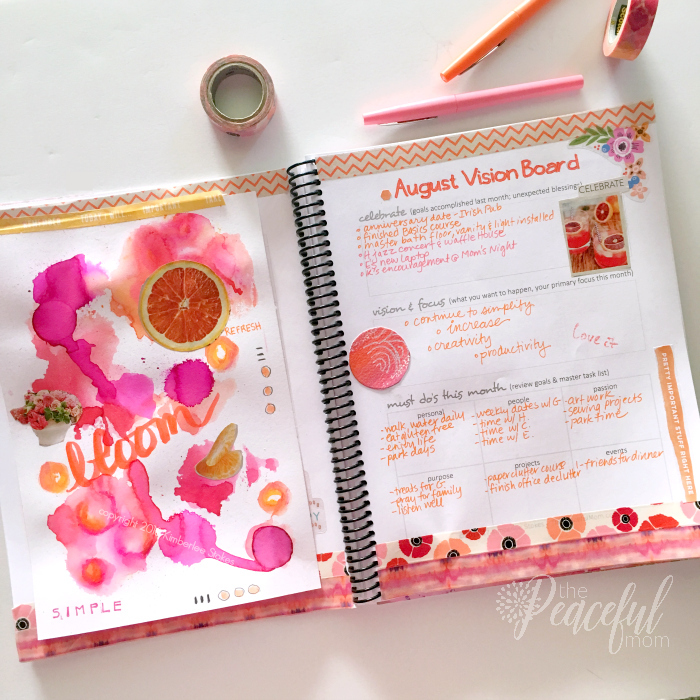 If you want a planning system that incorporates a monthly vision board as well as other creative organizing tools, try the Joyful Life Playbook/Planner. I would love to hear about your vision for this month, so leave a comment or a link below with your focus for this month.